The Taliban killed more than 100 members of the Afghan security forces inside a military compound in central Maidan Wardak province on Monday, a senior defense official said. "We have information that 126 people have been killed in the explosion inside the military training center, eight special commandoes are among the dead," said a senior official in the defense ministry in Kabul, speaking on condition of anonymity. The official said the assault began on Monday morning when the attackers rammed a car full explosives through a military checkpoint and detonated the vehicle inside the campus of the National Directorate of Security (NDS) forces training center in Maidan Shahr, the capital of Maidan Wardak province. Two gunmen entered the campus right after the explosion and shot at many Afghan soldiers before being gunned down during the clashes. Defense ministry officials said the Taliban had used U.S.-made armored Humvee vehicles captured from Afghan forces as a car bomb in order to breach the military fortifications. A second source residing in Maidan Wardak province said more than 100 members of National Directorate of Security (NDS) were killed in the complex attack. "I have been in touch with the NDS official in the province and they told me that over 100 members of the NDS were killed in the big explosion," the former provincial official said. Sharif Hotak, a member of the provincial council in Maidan Wardak said he saw bodies of 35 Afghan forces in the hospital. "Many more were killed. Several bodies were transported to Kabul city and many injured were transferred to hospitals in Kabul," said Hotak, adding that "the government was hiding the accurate casualty figures to prevent a further dip in the morale of the Afghan forces." "The explosion was very powerful. The whole building has collapsed," he said. Government officials in Maidan Wardak and Kabul declined to comment when asked if they were obscuring the death toll. Two senior officials in the interior ministry said the exact casualty figures were not being disclosed to prevent unrest within the armed forces. "I have been told not to make the death toll figures public. It is frustrating to hide the facts," said a senior interior ministry official in Kabul. A senior NDS official in Kabul said at least 50 people were killed or wounded in the complex attack. 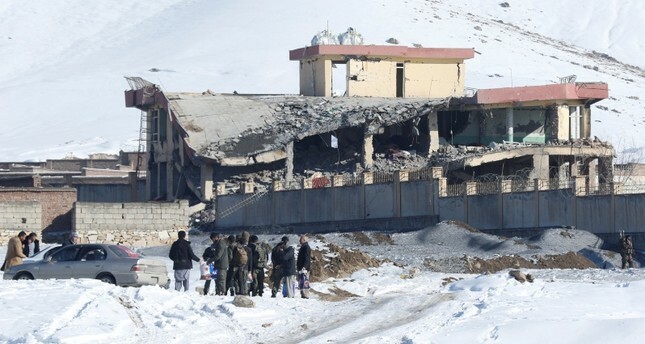 Abdurrahman Mangal, spokesman for the provincial governor in Maidan Wardak said 12 people were killed and 12 were injured when the car bomb exploded near the Afghan special forces unit. President Ashraf Ghani's office in a statement said the "enemies of the country" had carried out an attack against NDS personnel in Maidan Shahr. "They killed and wounded a number of our beloved and honest sons." Turkish President Recep Tayyip Erdoğan condemned the attack on Monday evening and extended his condolences to Ghani. Meanwhile, the Taliban said it met with U.S. officials in Qatar on Monday, in the latest round of talks between the insurgents and Washington aimed at bringing an end to the 17-year war. The U.S. has not officially commented on the reported meeting, which follows the last confirmed talks between the two parties in the UAE in December. "Following American acceptance of the agenda of ending the occupation of Afghanistan and preventing Afghanistan from being used against other countries in the future, talks with American representatives took place today in Doha, the capital of Qatar," Taliban spokesman Zabihullah Mujahid said in a statement. Taliban representatives have met several times with U.S. officials in recent months, but last week threatened to suspend the fledgling process, lambasting Washington for changing the agenda of the talks and "unilaterally" adding new subjects. The insurgents have long refused to hold direct talks with the Kabul government -- despite U.S. pleas -- which the Taliban dismisses as a puppet of Washington. In recent years the Afghan government has stopped releasing detailed casualty figures. Last year Ghani has said 28,000 Afghan police officers and soldiers have been killed since 2015, breaking the longstanding suppression on casualty data. Taliban insurgents claimed responsibility for the attack. Zabiullah Mujahid, a spokesman for the hardline terrorist group said they have killed 190 people in the complex attack. Last week, Taliban fighters set off a car bomb outside a highly fortified compound killing at least five people and wounding more than 110 Afghans and expatriates in the capital, Kabul. On Sunday, a suicide bombing in the southeastern province of Logar left eight policemen dead and another 10 wounded. The Taliban bombing targeted the provincial governor's convoy in Mohammad Agha district. The provincial governor and spy chief traveling in the convoy were unharmed. The Taliban have ramped up their attacks on security forces and government facilities in recent months, while Afghan and U.S. troops have increased operations against the militants' field commanders. Military sources say around 35 members of the country's security forces are killed every day in attacks and clashes. This is while the U.S. is still considering a significant troop drawdown in Afghanistan. Around 14,000 U.S. troops are stationed in the country, coupled with around 7,500 troops from other allied nations, according to RAND, a U.S. government research organization. In a report on Sunday, RAND said that if the U.S. considers "an early and complete or near-complete departure unrelated to a negotiated peace settlement," it could push Afghanistan into a civil war while the Taliban would expand their control throughout the country. If the withdrawal does take place, RAND noted, "the major advances that Afghans have achieved in democracy, press freedom, human rights, women's emancipation, literacy, longevity, and living standards will be rolled back throughout the country."